» Is this really worth $269,780? Is this really worth $269,780? Since this picture was taken June 20, the no-trespassing barricades have been set up again. What’s going to happen to the property at 405 Denver St. N.E. in Albany’s Willamette Neighborhood is up in the air. It would be nice to think there’s some way to rescue what has been a dump for some time and now is officially a city-owned dump. The place, overlooking Bowman Park, is on my riverfront beat, so I’ve been looking at it now and then since it appeared on the city code squad’s list of problem properties were squatters were hanging out and trash was piling up. The house is in foreclosure by a lender, and the owner of record transferred the deed to the city this spring. This allowed the city to post the place against trespassers and, with the help of the sheriff’s work crew, clean up the worst of the trash inside and out. As I reported last month, the city estimated its total cost of the cleanup at $15,000, including about $11,000 in cash expenses for the work crew, Dumpsters and materials. At City Hall, Marilyn Smith says the city will now strive to identify who actually owns the loan that’s the basis of the pending foreclosure. (The Linn County Assessor’s Office sends tax bills for the property to Specialized Loan Servicing in Highland Park, Colo. But Assistant City Attorney Sean Kidd says the loan serving agent may be different from the lender.) Then Albany plans to send the lender a bill for the cleanup costs. In the meantime, there are some questions. For example, you have to wonder how much the lender (whoever he or she is) or the Colorado company knows or cares about this property, for which they have routinely made property tax payments of around $4,500 per year. I’m also puzzled why the place, which looks like a dump even though it has six bedrooms and 3,800 square feet, is listed on the tax rolls as having a market value of $269,780. And in addition, now that the city owns the place, will the tax payments cease? Just wanted to let you know that I really missed you when you parted ways with the ADH, and I love these community vignettes! Does the city actually think they can sell this for roughly $270K? Got to think that’s a long shot. 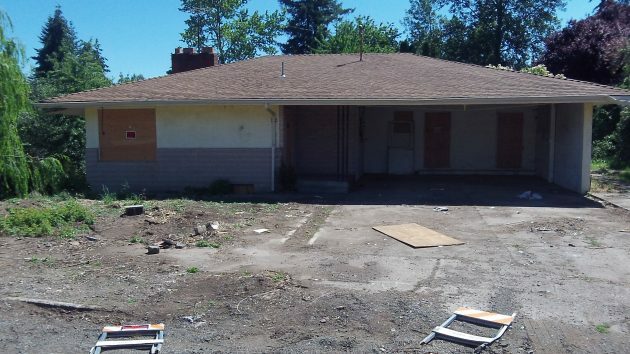 This kind of property abandonment really has to stop. We need some legislation that will hold a lender (or “agent” or whatever) responsible. Banks and money institutions make sure that they truly run the country and never accept any responsibility. I’m betting a Trump presidency will address this, although it’s really a state issue. Trump? Presidency?? Please NO! That guy didn’t even know that Scotland voted to stay in the EU, praised them for Brexit and bragged how HE would personally make money off it. Disgusting. And so are you if you vote for him.